Beads. Iridescent bright word, as does the beads. They decorated clothing and footwear since ancient times. Fine quality beads attracted artists at all times in all countries. Also make beautiful beaded jewelry on his neck and arms. During the appearance of beads in our lives, we have to thank the Phoenician merchants, who opened a random method of glass. Sometime in the distant past they carried the Mediterranean mined in Africa, natural soda. Once they stopped to spend the night on the shore and build a fire, furnished it with pieces of ash. The next morning, raking the ashes, merchants found stunning beauty bar, which was hard as a rock, clear and sparkled in the sun. It was this way for about six thousand years ago was born glass making, from which after a while separated craft making beads and glass beads. At first, the beads was quite large and opaque, but the technology is improved with each century, and beads of today catches the eye brightness, shine in the sun and a huge variety of shapes and colors. 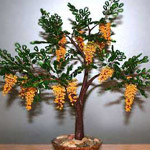 Modern masters are accumulated thousands of years of experience and in addition to jewelry and clothing and footwear manufacturing various strands, bracelets and necklaces, as do the stunning beauty of trees and flowers. 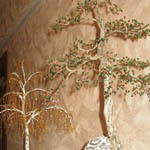 Looking at this bead story is hard to believe that this is the handiwork of man. Mastering the art of Beading is an illustrated encyclopedia of techniques and original designs, but it is also a comprehensive reference guide to the art and craft of beading. I have gather together all of the information i have gained through years of first-hand experience as i learned and practiced this inspiring and incredibly enjoyable craft. Beading / Bead work is the art or craft of attaching beads to one another usually by the use of a needle and thread or soft, flexible wire. 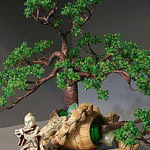 Beads takes the form of jewelry, personal adornment, wall hangings and sculpture. People made and used beads as long as 5,000 years ago. Beads have also been used for religious purposes, as good luck talismans and as curative agents. 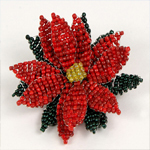 Bead work is often used as a creative hobby to create jewelry, coasters, flowers, trees and dozens of other crafts. Beads are available in many different designs, sizes, colors, and materials, allowing much variation among bead artisans and projects. Most Native bead work is created for tribal use but bead workers also create conceptual work for art. 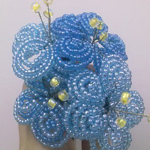 There is so much you can do with beads from decorating clothing, making hanging art, flowers, jewelry and many more. 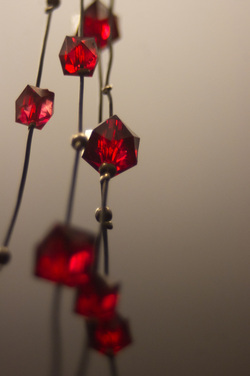 So there are different categories of beading and jewelry is the one of the main ones. Art and useful items would be another category. 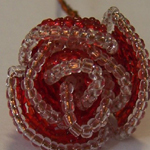 If you want to do something like beaded flowers then you have to know something about wire, because the wire is what supports the petals. There are lots of patterns available for beading and my website has beading tutorials that I offer for free. 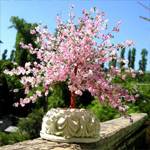 Learn how to beading flowers and trees.